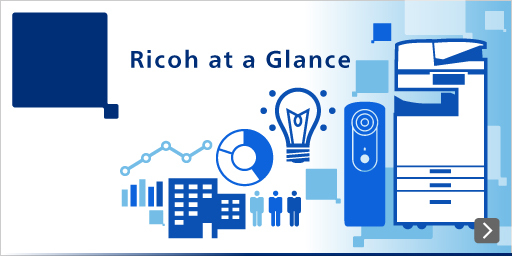 Ricoh has succeeded in developing a few micron thick piezoelectric thin film actuator using the ink-jet printing (IJP) method. The IJP method is a technology that ejects a wet material dispersed ink to a desired pattern. In the conventional electrical device development process (semiconductor process), patterning is done by an etching method. Replacing that method with the IJP method will dramatically reduce cost because the IJP method directly forms patterns by ejecting ink. The IJP method increases material use efficiency, especially for materials difficult to etch like piezoelectric materials. It also considerably reduces the cost of devices, the number of processes, and the environmental impact during manufacture. Using the IJP method, the desired pattern can be formulated and easily changed by merely changing printing data; it is therefore suited for manufacturing diverse devices in small lots. In addition, the IJP method has the advantage that its manufacturing equipment is simple and its facility investment is half that of ordinary semiconductor processing equipment. Unique features of Ricoh's IJP method are: (1) we developed a solvent resistant IJ head for industrial use, and (2) we own the technology for formulating piezoelectric material solution interfused ink (by CSD method (*1)). 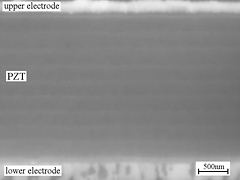 Ricoh is one of few companies that own both core technologies for the development of piezoelectric thin film using the IJP method. *1CSD method: The abbreviation of Chemical Solution Deposition method, also called the sol-gel method, is to synthesize a material by starting with gelification of the sol solution. It is a low-temperature synthesis method and can be applied to synthesize materials of various microstructures, topologies and functions. We need several technologies to obtain accurate patterns using the IJP method. 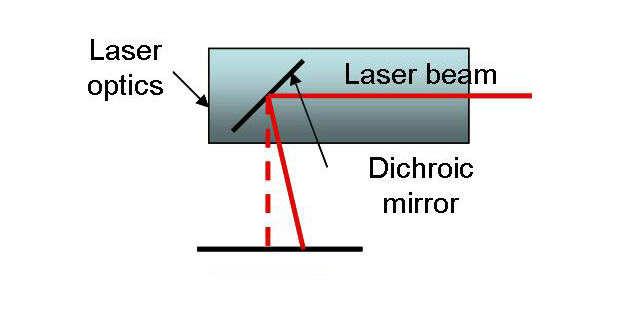 Ricoh, as Figure 1 shows, developed the following: the technology to control hydrophobic and hydrophilic areas on the surface of a substrate (functional material forms only on a hydrophilic area), the technology to control ink ejection, and the technology to bake a relatively thick film by excluding unnecessary materials effectively. Only a synthesis of all these technologies can achieve accurate patterning. When you spill a drop of coffee, an edge of the drop becomes darker; we call this the “coffee stain effect.” A similar effect happens in the IJP method; as Figure 2 shows, in the ink drying process, the internal convection flow occurs and a concentration of a solid content increases at the pattern edge. Ricoh solved this problem by optimizing the solvent materials and drying speed. Figure 3 shows the measured geometry of the actuator sample we produced using the IJP method. Figure 3(Left) shows the actuator sample without the coffee stain countermeasure and Figure 3(Right) shows the actuator sample with the coffee stain countermeasure applied. 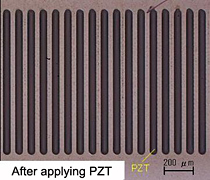 Figure 4 shows the magnified photograph of the PZT thin film sample at 2μm thickness using the IJP method. As you can see, the dark area is the PZT actuator and it shows a uniform pattern. Figure 5 is the actuator's cross section photograph taken by SEM (Scanning Electron Microscope). A light gray area shows the surface boundary of a single layer; as you can see, thickness of the single layer is uniform and there are neither voids nor defects, confirming good quality. Figure 6 shows polarization properties of the PZT actuator. There is a large amount of polarization relative to the drive voltage, which means that displacement of the actuator is also large. The dotted line shows the polarization property of a PZT actuator formed by a spin coating method (spin substrate in a high speed and form thin film by centrifugal force) and the solid line shows the polarization property of a PZT actuator formed by the IJP method. It is clear that the polarization property of the PZT actuator formed by the IJP method has the same properties as the PZT actuator formed by the spin coating method. We verified that the actuator developed by the IJP method has enough displacement for practical use. IJP technology has already been applied in part of the manufacturing process of LCD panels and three dimensional printers (rapid prototyping). In the future, IJP technology is expected to be applied to the manufacture of printed electronics like flexible displays and photovoltaic cells. It will also be applied to the manufacture of electronic devices. Sorted by : field "Fundamental Technologies" "Environment" "Printing"